Definitely running a bit late this week, I think I was all crafted out from the weekend and had no inspiration for this week's LIM challenge. The challenge being circles, which seems remarkably simple but hey ho, not so!! 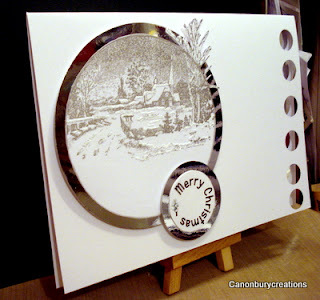 I used a La Blanche stamp, which stamps in a semi circle and just used a gray pen to complete the circle. I glittered to enhance the snowy effect and mounted on to silver mirri. I punched circles out down the side and punched mirri with the same punch and adhered them under the cut outs. The sentiment was also mounted on to mirri. Not particularly happy with this submission but at least it's one more for Christmas! stunning card Val and I love the circles on the edge of the page...brilliant. Absolutely gorgeous christmas card!!!! You did a wonderful job!!!!! 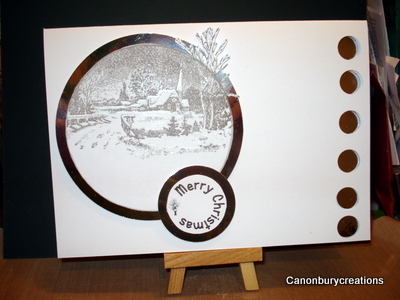 This looks great Val, a lovely Christmas scene! Val i LOVE this fab style.